AND as of today InControl can now control Belkin Wemo Devices with my new plugin. Drop the plugin in your InControl plugins directory and you’ll get a shiny new Plugin Menu where you will be able to add your Wemo Devices by IP Address. Once you have added them InControl treats them like any other device where you can Mirror, Schedule and Automate along with your existing ZWave devices. Additionally since Belkin doesn’t make an Android/Windows Phone App for Wemo Devices this means you can use the InControl Apps to control your Wemo Devices. 1. Set your Wemo’s up via your iPhone app as normal (skip this step if you already have them on your wifi network) following the Belkin user guide instructions on how to initially join them to your Wifi Network. 2. From this point your Wemo’s are connected to your wifi network and are discoverable via uPNP. 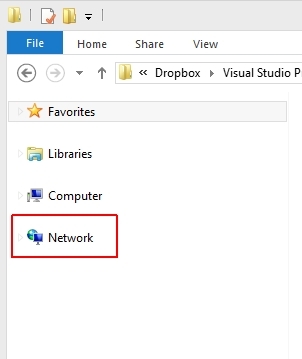 This means if you open Windows Explorer and hit ‘Network’ you should see your Wemo devices in ‘Other Devices’ section. 6. 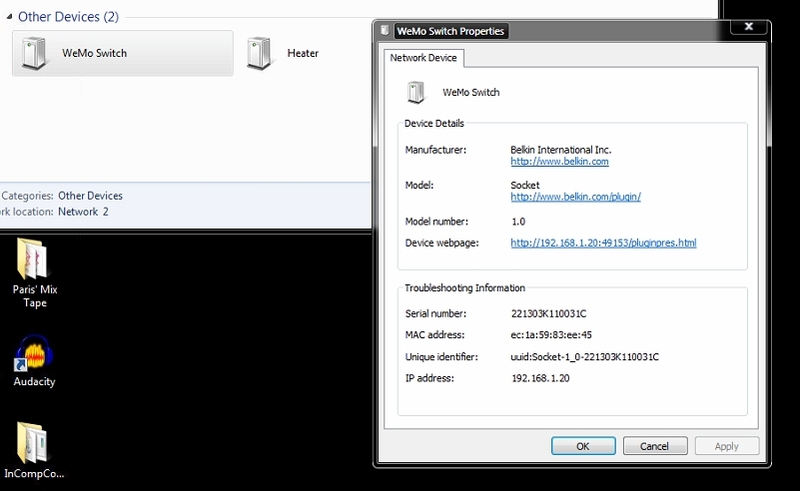 Add your Wemo Device – Give it a Name and enter the IP Address associated with this Wemo Device. 7. From this point InControl will actively track the status of this device and you will be able to schedule, scene and turn it on and off along with your ZWave devices. The InWemoControl plugin is still in Beta so it may have a few bugs but feel free to use it and shoot me back any feedback! Hi akotlarc, is there anything in the InControl Log as to why it is crashing thanks? I’m happy to help where I can..
InControl has a log in its application directory which would help you here. It’s seems it is the zwave service which is raising the error – I would perhaps try running InControl as a standalone application first (not as a service) and see if this raises any noticeable exceptions. Would you happen to have a newer verison of the plugin? No newer version required, this version still works with the latest InControl HA version.. Let us know if you need help or a still having problems with the plugin Jenson. Just referring to this, http://store.incontrolzwave.com/boards/topic/350/wemo-plugin That’s all. Apparently there’s newer version with bug fixes. Our Wemo plugin (InWemoControl) is different to the one you can purchase from InControl directly Jenson (and ours is free!). Ours is a little more flexible where you can add only the Wemo devices you want to control to InControl and doesn’t rely on UPNP discovery. I’ve been trying this plugin for a couple of days now. I have a couple of WeMo Light Switches, after I switch the lights on with InControl (PC/iPhone app). The indicator switches off even though the lights are still on. Hi, I’m using the Free edition for trial which I have installed on the PC. I cannot see the Wemo Plugin. Have copied the Wemo Plugin to the directory as instructed above. Still can’t see Wemo Plugins menu. I have rebooted the PC. Still can’t see the Wemo plug-in. Free edition of ICHA is 3.126.5305.30731. This is just trial to see if it works or not. The trial version of InControl doesn’t support plugins Graham I think. I have a paid version. InControl is excellent though – for the price it’s well worth it to start getting into Home Automation.